ISLAMABAD (AP) — A Pakistani anti-graft tribunal on Friday announced a much-awaited ruling in a corruption case against former Prime Minister Nawaz Sharif, sentencing him to 10 years in prison over purchases of luxury apartments in London. Sharif, who is in London with his ailing wife, was not in the courtroom for the verdict and was sentenced in absentia. It's unlikely that Pakistan will seek his extradition and the former premier hours after the ruling said he was returning home, without specifying a date. "I am coming back to Pakistan," he said at a news conference aired on Pakistani TV. "I am not afraid of jail." He said he would continue his struggle "for the supremacy of law and the constitution." Sharif said his wife was on a respirator at a London hospital and that he was waiting for her to regain consciousness, so he could talk to her before returning home. He asked Pakistanis to back his party's candidates in the upcoming parliament elections and called Friday's ruling against him "strange," claiming none of his family members misappropriated government funds. It was the latest blow to Sharif, just weeks ahead of the elections later this month, and the first verdict against the embattled former premier who has faced a string of trials since he was ousted from office by the Supreme Court last year for concealing assets abroad. In Friday's ruling, the court also sentenced Sharif's daughter, Maryam Nawaz, to seven years in a case stemming from documents leaked from a Panama law firm while her husband, Mohammad Safdar, got sentenced to one year for giving false information to investigators. Judge Mohammad Bashir concluded in his written statement that Sharif and his family had failed to disclose the source of funds they used to purchase luxurious London properties and did not report the purchases to tax authorities. Bashir also fined Sharif 8 million British pounds, about $10.6 million, while his daughter was fined 2 million British pounds, about $2.6 million. The judge also ordered the Sharif family's London properties confiscated. "This verdict shows that these Avenfield apartments were purchased using corruption money," prosecutor Sardar Muzaffar Abbasi told reporters outside the court Friday, referring to London properties belonging to the Sharif family. In a tweet, Sharif's daughter said her father was punished for resisting "unseen forces," an apparent reference to the military that has ruled the country for half of its modern history since it gained independence from Britain in 1947. She added that the people of Pakistan were standing by her father. Nawaz is considered the political heir to her father and Friday's ruling barred her from running for a seat in the parliament in the upcoming elections. Sharif was forced into exile by President Pervez Musharraf, a former army general, who toppled Sharif's government in a bloodless coup in 1999. Musharraf was later forced to quit after the party of former Prime Minister Benazir Bhutto came into power. He was declared a fugitive in 2013 and since then has been living in self-exile in Dubai, United Arab Emirates, to avoid arrest on criminal charges. Musharraf recently quit his political party indicating he had no plan to return home, despite having earlier said he wanted to run for a seat in parliament. Sharif has criticized judges for not issuing orders to repatriate Musharraf so he can stand trial in multiple cases pending against him. 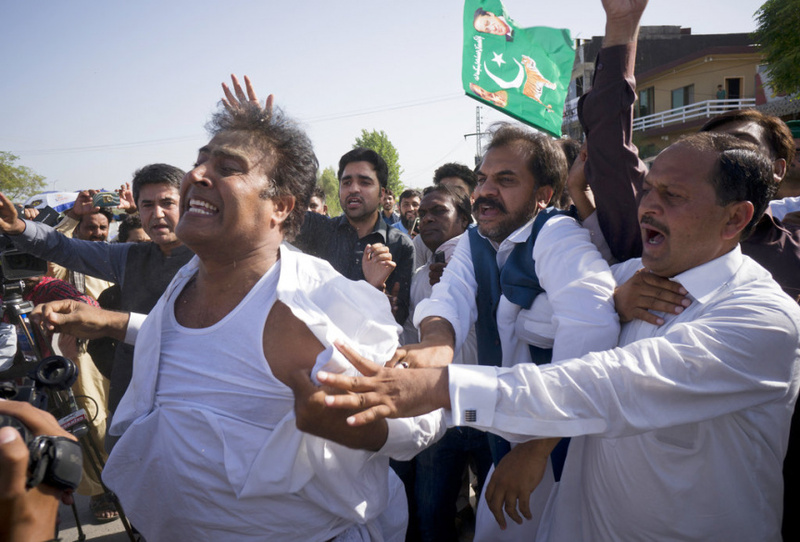 Sharif's party, the Pakistan Muslim League, rejected the ruling as a grave injustice to the popular former leader. "We will use all legal and constitutional options against today's court rulings," said Shahbaz Sharif, the party chief, appealing on supporters to exercise restraint and vote for their candidates in the July 25 vote. Sharif has 10 days to appeal the court ruling and he can also seek bail before returning home. Pakistani authorities can arrest him on his return if he is not granted bail. Sharif's political opponents hailed the verdict. "Today court convicted and sentenced the biggest thief of Pakistan," said Shaikh Rashid Ahmad, a senior politician and political opponent of Sharif. "We are very happy today as a big thief has been punished by judiciary," said Imran Khan, a popular former lawmaker whose Pakistan Tehrik-e-Insaf party is also running for office. Khan is also hoping to become the country's next prime minister. Khan told an election rally in the country's northwest that Sharif might have escaped punishment had he not waged a legal battle against him years ago. "Now it's your duty to reject corrupt politicians in the elections," he said.